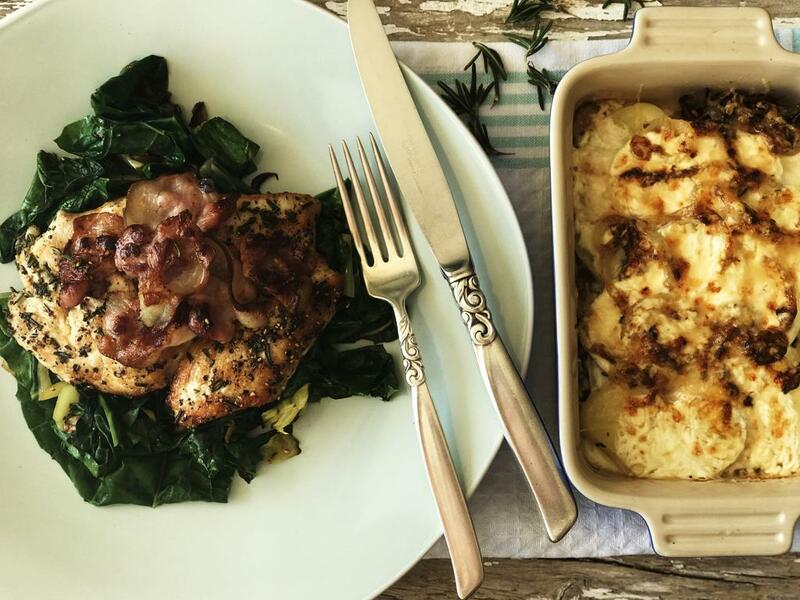 Chicken and bacon pan-fried in fresh rosemary and served with the tastiest, cheesy potato gratin and wilted chard. A definite fave! Preheat oven to 200°C. Boil the kettle. Prepare all ingredients as indicated above. Place the chicken breasts (one at a time) between two sheets of cling film and bash with a full wine bottle or rolling pin to flatten (5mm to 7mm). Scatter chicken on both sides with rosemary, freshly ground salt and pepper. Set aside. Place a saucepan of lightly salted boiling water on to high heat. Add the sliced potatoes and cook for no more than 7 minutes. You want them to be cooked but not falling apart. Drain and set aside. 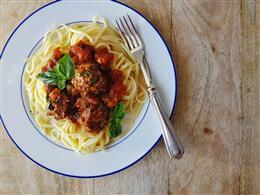 Place a few glugs of olive oil in a frying pan on high heat. Add the onions and sauté for 4 minutes until translucent. Stir in the chicken stock granules and dried sage. Keep the pan aside to cook the swiss chard later. Layer the potatoes and fried onions in a casserole dish, pour the cream over the top and scatter with the cheddar cheese. Then place under the grill for 10 minutes until lightly browned. Place a large frying pan on medium to high heat. Cook the bacon rashers until browned on both side – about 2 minutes. Remove and set aside. Add a little more olive oil to the pan and when it’s hot, add the chicken breasts and cook for 3 minutes each side until brown. 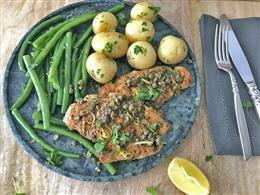 Cook in batches if your pan is not big enough – chicken breasts should not overlap in the pan. Remove and set aside. Put a few glugs of olive oil in the pan you used earlier (for the onions). Place it on medium heat. Add the leeks and sauté for 2 minutes until soft. Then add the swiss chard and leave to wilt – about 2 minutes. To serve, plate the chicken, swiss chard and potatoes. Top with the bacon. "The rosemary and chicken was absolutely delicious, especially when eaten with the bitter-sweet swiss chard. The potato bake seemed a bit bland (I'm not the biggest fan of plain potato), so I added about a cup of sour cream mixed in some milk and about triple the amount of cheese. The cheese provided should have at least been twice as much as it didn't cover the top of the bake. I feel like I could have used less potato (maybe 1 less). I had six large ones, and that was enough for two and a half layers with the dish that I was using. After the meal, we still had half the potato bake left (not because it tasted bad, but because there was a lot), so we gladly had it the next day. Overall, the food was delicious and I would definitely cook this again with the same changes that I made."